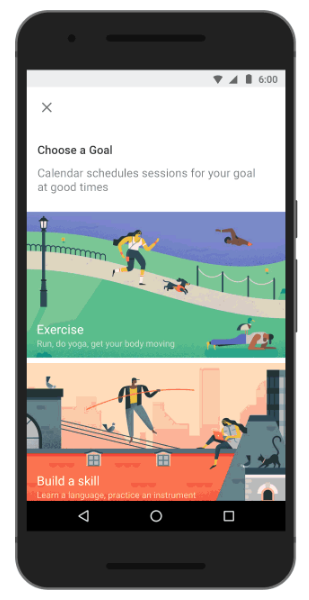 Google Calendar has launched a feature called Goals that uses machine learning to help you figure out when you have time to pencil in stuff like spending time with your family or exercise. The feature is now available for Calendar’s Android and iOS apps. Goals are set up by clicking into a category (which currently include Exercise, “Build a Skill,” and “Me Time,” though they can also be customized) and selecting a specific activity. Then Calendar will automatically find open slots, fill them in with your goal, and send reminders. If you schedule something else during those times, Google Calendar will find another window for your goal—but, in a tool that will surely be chronically abused by procrastinators, they can also be deferred. Goal’s machine intelligence, however, will attempt to outfox your busyness/lack of motivation, finding better time slots for goals until you can no longer avoid them. For people wondering why on earth someone would need a machine learning algorithm that reminds them to take care of themselves, talk to loved ones, or otherwise have some semblance of a personal life, Goals’ purpose is not very different from many other personal productivity apps designed to help people create healthy habits. In fact, Goals integrates many of the features from Timeful, a smart scheduling app Google acquired last year. The advantage of Goals, of course, is that it sits on top of a tool that many people have already relied on for years. Google Calendar turns 10 this year and is marking its anniversary by adding new features like a to-do tracker called Reminders that will help it compete against other time-management apps. Goals may eventually become available on the web, but a Google rep said there’s no specific timeframe current planned (it took Reminders about five months to make it into Calendar’s browser version).